There seem to be two versions of the F3 Series at the moment. The earlier version (the one we originally reviewed only forensically) seems to have many more issues than this unit we tested in house. For the price of a very low-budget/quality converter, this Flexispot gives you the space-conscious standing experience that's also pleasant to look at. Compact size. Sturdy construction. Competitive price. Small keyboard tray size. Minor packaging issues. This small converter series is a real find if you’re looking for a compact standing desk to go in your office at home or work. Available in three colors and two size options, each unit features a quick release keyboard tray and an indented groove to hold a variety of mobile devices. The version we tested has a desktop that is 28.9" deep (including the keyboard tray) and 26.8” wide, which leaves enough space on your regular desk for a laptop, papers, and other work tools. If you’re 6’1″ or above, your regular desk needs to be at least 31” tall for you to comfortably use these models. The Flexispot Compact Series is a two converter collection comprising 27” and 32” sit-stand desk risers that can fit any 24” (deep) sitting desk. Featuring a removable keyboard tray, a tablet/smartphone groove, and a ten-page installation manual, this little fella packs the stability of a Z-Lift with the small footprint of a Post & Base at a modest budget range of $200-$270. Perfectly sized for remote workers, the Flexispot Compact is better suited for Mac and other all-in-one computer users who don’t require much desktop space. It does have monitor arm compatibility, but don’t hope for dual monitor support as the unit’s small work surface narrows toward the rear, and its standard 33-lb weight rating is just the bare minimum for holding most two monitor setups. Upon our initial review, the Flexispot Compact Riser was being offered in seven different colors, but upon launch we saw only three colors being offered: black, white, and darkwood. Not too surprising. Most brands lean toward a simpler selection of colors and customers generally prefer black anyway. That being said, the darkwood finish has a classy feel to it, and most of the testers in our office were more than mildly impressed. While we were excited for a wider color selection, we’re sure Flexispot had strategic reasons for starting with this modest assortment. Most buyers will be content with one of the three options. One of the few downsides to this Flexispot model (and it’s minor), is the fact you have to do a little bit of assembly. Most competing models come entirely pre-assembled. You just take them out of the box and you’re ready to go. Compared to most full standing desks, on the other hand, the assembly process was quick and easy. You started by attaching two connector pieces to the keyboard tray using an allen key and screws. Then you picked up the keyboard tray and slid those connector pieces into grooves underneath the work surface. After placing some plastic grips on the underside of the base, you’re ready to go. The package included some stickers you can use to secure your monitor stand and a short cable sleeve for some proper cable management, too. One of the first things we noticed while using the Flexispot Compact is its impressive depth-of-field. Just based on its name, you might expect the unit to be narrow and short, but that’s not the case. What would be the issue with that? If the work surface depth is too short, your monitor would be too close to your eyes. Smaller desk converters are usually the culprits, and if you’re using two monitors, the problem is even more acute. The Flexispot Compact’s nearly 29”-deep work surface provided us plenty of room for comfortable screen-viewing with a single monitor. In fact, we think it has the best depth-of-field of any of the smaller desktop converters we’ve taken into our lab for testing. There is one more primary feature of the Flexispot Compact series that left us mighty impressed. That is the lift mechanism—and for two reasons. Precision and silence. Its bowden cable braking system, like the iMovR ZipLift+’s, permits you to stop the height adjustment at literally any position you want within its range. While admittedly most users won’t notice the difference at the millimeter level, you may find yourself enjoying the freedom of stopping the unit whenever you like. And more importantly, you won’t have to worry about latching the unit properly into one of its predefined height settings. 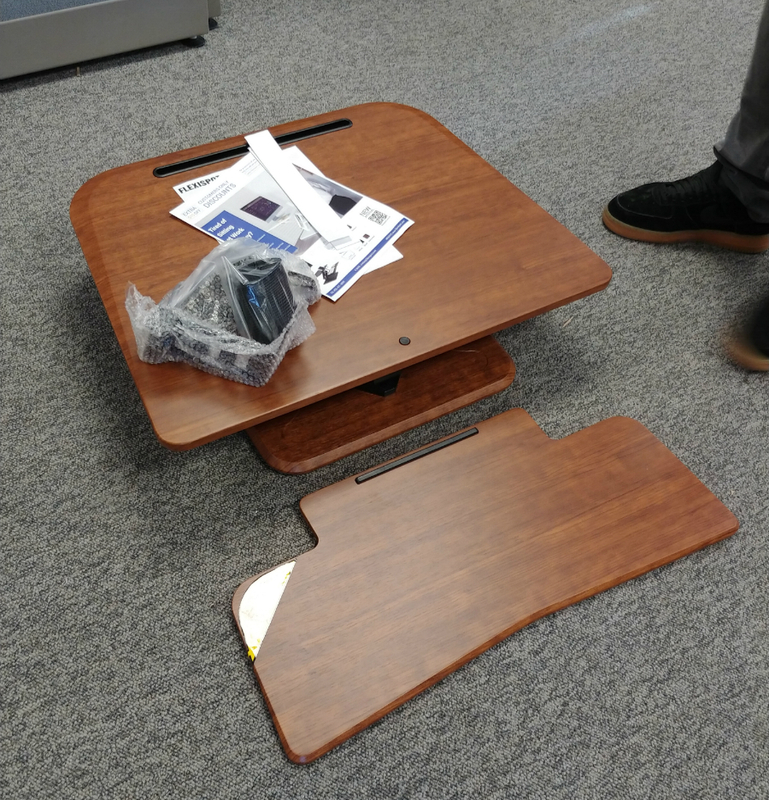 As testers of Varidesk products in the past, we know how obnoxious it can be to have to fish around for the right height, and how relieved you are when it finally clicks into place. Did we mention clicking? That’s the other benefit of a bowden cable braking system like the Flexispot Compact’s. Since there are no predefined height settings you need to latch into, there is no clicking noise that accompanies the height adjustment process. Many of us want to remain inconspicuous in the office place, rather than screaming for attention. And yes, we’d rather not announce each time we’re sitting or standing. So if you’re like us, a silent lift like the Flexispot Compact is clearly the way to go. The Flexispot Compact is what we call a Z-Lift, Single Lift, in that it only has one adjustable bar in the middle of the unit, instead of one on either side. You sacrifice a bit in stability when you go this route, but it cuts down on costs substantially, and in the case of this smaller-width unit, it still keeps the desktop sturdy enough for sustained typing. The Compact features a single gas piston that is middle-of-the-road in size and strength. The counterbalance force will give you considerable help lifting the weight of the unit up or down. However, it doesn’t look like the counterbalance force is adjustable. Depending on the amount of weight you put on the unit, fine-tuning the counterbalance strength can make lifting even easier. The unit goes up easily without shooting up too much. Still, we advise you to exercise care when raising any desktop converter, as these tend to eagerly ascend and show resistance on their way down, which is the case with the Compact here. Still, the operation is noiseless and quite smooth once you manage to apply enough force to bring the desktop down. And when you’re done with the keyboard tray (we’re not sure why...), just gently hold both levers down and pull the tray toward you until it releases (which may not be as quick as advertised, but we’re thankful for how sturdy the tray is). We always like to look at Amazon user reviews to get a feel for how people interact with a product. In this case, user feedback is mostly positive. The product has some very minor packaging issues that include an occasional missing screw or part, but it’s nothing a call to the customer service cannot resolve in a swift and timely manner. Do be sure to carefully read the installation manual to make sure you install the keyboard tray properly. Some inattentive users reported installing it upside down, which caused their tray to fall off. There seem to be two versions of the F3 Series at the moment. You can differentiate the two by their keyboard trays (see the featured image and our own photography). The earlier version (the one we originally reviewed only forensically) seems to have many more issues, including the ones we’ve mentioned above from Amazon. Our unit came with a bigger keyboard tray (with two-arms) and without drill holes for the wrist rest. The Flexispot Compact series isn’t a perfect product, but what is? We have to say the version 2.0 is the best low-budget small-space converter you’ll find in the market. Even if you are a bit budget-constrained, the Flexispot is the best quality product in its niche category—especially for the price. Want more desk converter reviews? Check out how the Flexispot F3 Series compare to competition in our comprehensive sit-stand desk converter comparison review. And subscribe to our newsletter if you'd like to stay on top of the adjustable height workstations trends. Flexispot offers a 3-year warranty for the frame, medium-fiber desktop and mechanisms on all sit-stand workstations purchased on or after October 5, 2016.